Hot on the heels of Three Kingdoms and The Battle of Red Cliff comes yet another Chinese period epic full of gargantuan battle sequences and more intricately-designed armour that you can shake a sword at. After her father dies in battle, Yen Feier (Cantopop sensation Kelly Chen) must join forces with a hunky warrior (Donnie Yen) to unite her warring kingdom and protect it from both internal divisions and the treachery of outsiders. And that’s it, in a nutshell. It’s nothing that hasn’t been done before, on higher budgets, but this fantasy is saved by some artful choreography courtesy of director Ching Sui-Tung (A Chinese Ghost Story) and lush cinematography from masterful lensman Zhao Xiao-Ding (House of Flying Daggers). 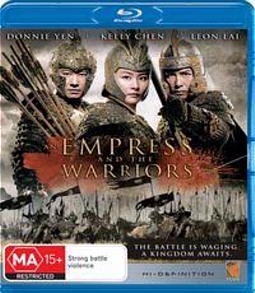 An Empress and the Warriors never really seems certain whether it wants to be a straight action film, a romantic character study or an all-out war epic, but the overall aesthetic engendered is so breathtakingly sublime that it doesn’t actually matter. The set and costume designs are absolutely flawless, and though the CGI fails on one or two occasions the special effects also hold up very well. Because the visuals are so obviously the film’s strength, however, the Blu-ray transfer winds up being decidedly on the disappointing side. Picture quality is variable throughout, with some scenes crystal clear and others downright fuzzy. I don’t if this is a problem with the transfer process itself but it’s distinctly noticeable and distracts from what should be an unbridled visual treat. And while the DTS-HD-5.1 and Dolby TrueHD 5.1 audio tracks sound fine in and of themselves, the voices have clearly been dubbed and mostly fail to synch up to the movement of the actor’s lips. Despite its well-worn themes this is an ambitious and stunningly shot feature from Ching. Which is why it’s such a shame that the technical deficiencies are so glaring- they detract entirely from what should have been an enjoyably epic viewing experience. The lack of any special features further ensures this bare-bones release is one for die-hard genre fans only.